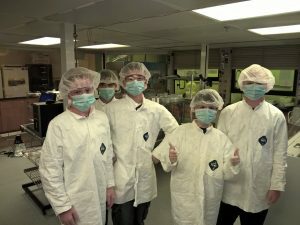 A firstnano chemical vapor deposition (CVD) system has been installed in the Michigan Technological University Microfabrication Shared facility (MFF). 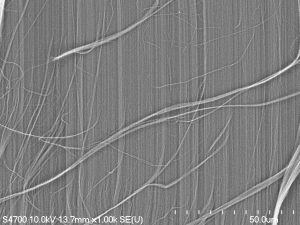 This system allows for the growth of carbon nanotubes (CNTs) using hydrogen and ethylene and an iron catalyst. This capability was brought into the MFF by Dr. Parisa Abadi through her start up package and has generously allowed other faculty and researchers at MTU access to this system. If you would like to use the system, or would like like more information please contact Dr. Parisa Abadi (pabadi at mtu dot edu) or Chito Kendrick (cekendri@mtu.edu). I am doing my best to keep these rates as low as possible to allow for more usage at the lowest cost possible. Many biological lab-on-a-chip applications require electrical and optical manipulation as well as detection of cells and biomolecules. This provides an intriguing challenge to design robust microdevices that resist adverse electrochemical side reactions yet achieve optical transparency. Physical isolation of biological samples from microelectrodes can prevent contamination, electrode fouling, and electrochemical byproducts; thus this manuscript explores hafnium oxide (HfO2) films – originating from traditional transistor applications – for suitability in electrokinetic microfluidic devices for biological applications. 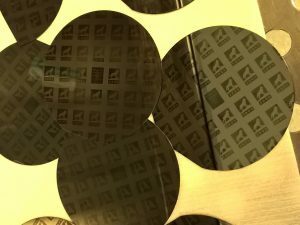 HfO2 films with deposition times of 6.5, 13, and 20 min were sputter deposited onto silicon and glass substrates. The structural, optical, and electrical properties of the HfO2 films were investigated using atomic force microscopy (AFM), X-ray diffraction, energy dispersive X-ray spectroscopy, Fourier transform infrared spectroscopy, ellipsometry, and capacitance voltage. 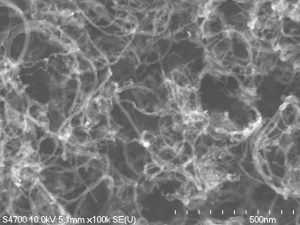 Electric potential simulations of the HfO2 films and a biocompatibility study provided additional insights. Film grain size after corrosive Piranha treatment was observed via AFM. The crystalline structure investigated via X-ray diffraction revealed all films exhibited the (111) characteristic peak with thicker films exhibiting multiple peaks indicative of anisotropic structures. Energy dispersive X-ray spectroscopy via field emission scanning electron microscopy and Fourier transform infrared spectroscopy both corroborated the atomic ratio of the films as HfO2. Ellipsometry data from Si yielded thicknesses of 58, 127, and 239 nm and confirmed refractive index and extinction coefficients within the normal range for HfO2; glass data yielded unreliable thickness verifications due to film and substrate transparency. Capacitance-voltage results produced an average dielectric constant of 20.32, and the simulations showed that HfO2 dielectric characteristics were sufficient to electrically passivate planar microelectrodes. HfO2 biocompatibility was determined with human red blood cells by quantifying the hemolytic potential of the HfO2 films. Overall results support hafnium oxide as a viable passivation material for biological lab-on-a-chip applications. Collins, J.L., Hernandez, H.M., Habibi, S., Kendrick, C.E., Wang, Z., Bihari, N., Bergstrom, P.L. and Minerick, A.R., 2018. Electrical and chemical characterizations of hafnium (IV) oxide films for biological lab-on-a-chip devices. Thin Solid Films, 662, pp.60-69. 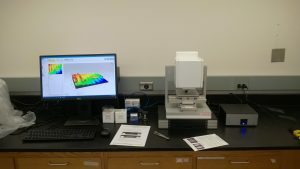 The new 3D profiler (https://www.filmetrics.com/opticalprofilers/profilm3d) has arrived and is installed. The system will allow for measuring the surface profile of samples to extract feature heights and surface roughness. Contact Dr. Kendrick (cekendri@mtu.edu) if you would like to learn more about the system. 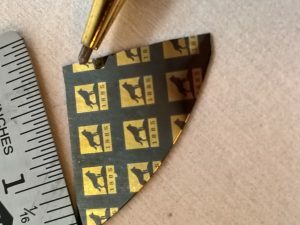 the College of Engineering at Michigan Tech, has spun off Microdevice Engineering, Inc.
to be as easy to use as a blood glucose meter. fabricated using the Microfabrication Core Facility.